There is truly no better time than the fall season to cook warm, comforting, savory dishes at home. And, when it comes to said fall dishes, I believe that the flavors of butternut squash and sage are a culinary match made in heaven. The minute October hits, I crave any recipe that involves these two autumn flavors. So, I recently put my cravings to rest by making these homemade butternut squash raviolis with a sage brown butter sauce. I have a pasta maker at home, so I like to make my own pasta when I can. You might remember me breaking out this gadget in my book Celebrate, and if you’re a pasta lover, I highly recommend you get one. 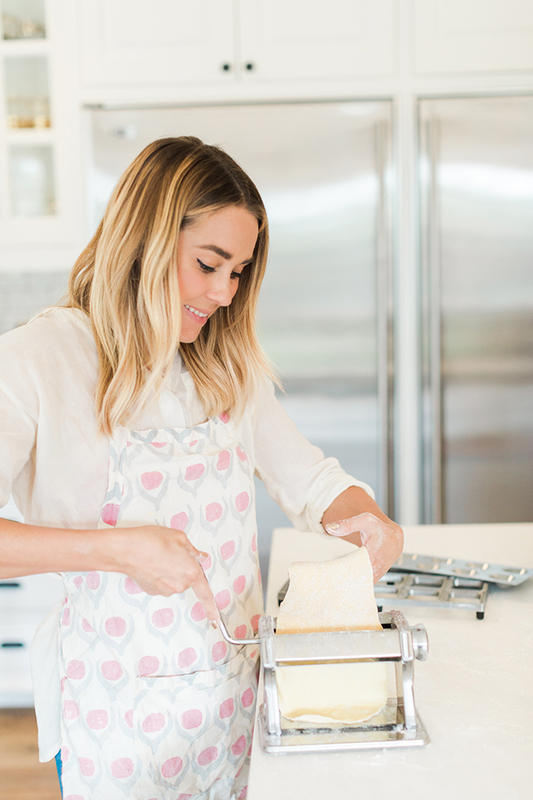 They’re tons of fun, and your pasta will turn out absolutely delicious. 1. Cut your butternut squash into half and scoop out all the seeds. Cover the exposed flesh with salt, pepper, thyme and nutmeg (about a teaspoon of each). 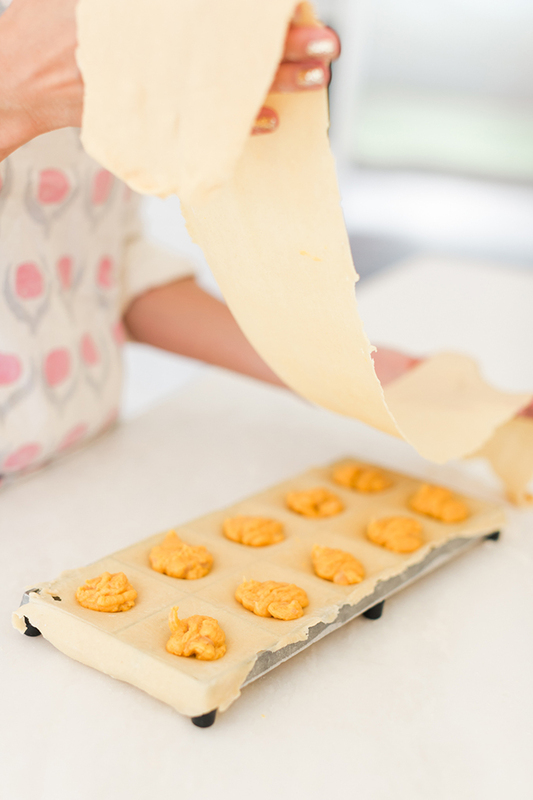 Preheat your oven to 375 degrees, and place your two squash halves on parchment paper on a cookie sheet. When preheated, cook for 45 minutes to an hour, or until you can pierce the flesh with a fork. 2. Once your butternut squash is ready and soft, scoop out the insides into a food processor. Blend until mixture becomes a puree. 3. In a large saucepan, melt 2 tablespoons of butter, and add all of your diced shallot, brown sugar and garlic. Cook until caramelized. 4. Then add the pureed squash, heavy cream and a teaspoon each of salt and pepper. Cook for two minutes, then remove from heat and add in your parmesan cheese and a pinch of nutmeg and stir until mixed. Let cool completely. 1. 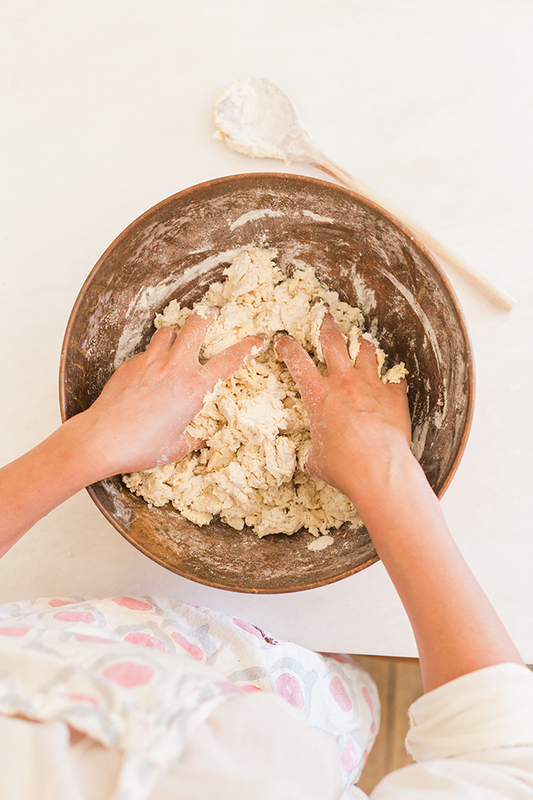 To make your dough, add your flour and 1 teaspoon of salt into a large mixing bowl. 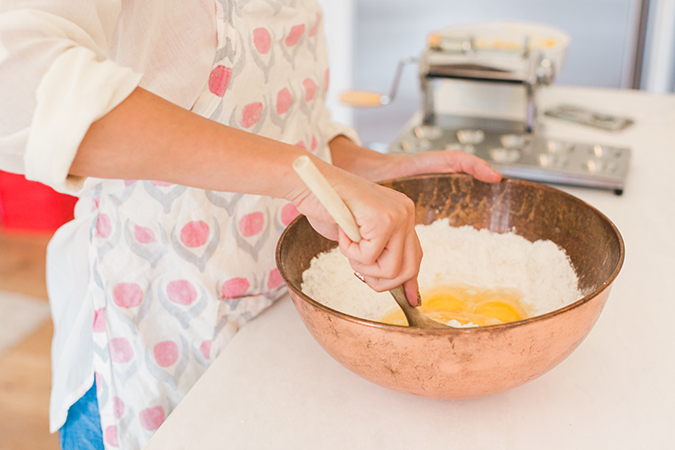 Add each of your three eggs one by one, folding the eggs into the flour (save one egg for later to make an egg wash). Drizzle in 1 tablespoon of olive oil and continue mixing by hand. 2. Dust flour on a hard surface (I use my countertops) and take your dough out and knead until it forms a ball. Fold the dough over itself until it becomes elastic and smooth. 3. Brush the surface of your dough ball with the remaining olive oil and let rest in the refrigerator. Note: This resting step is important! 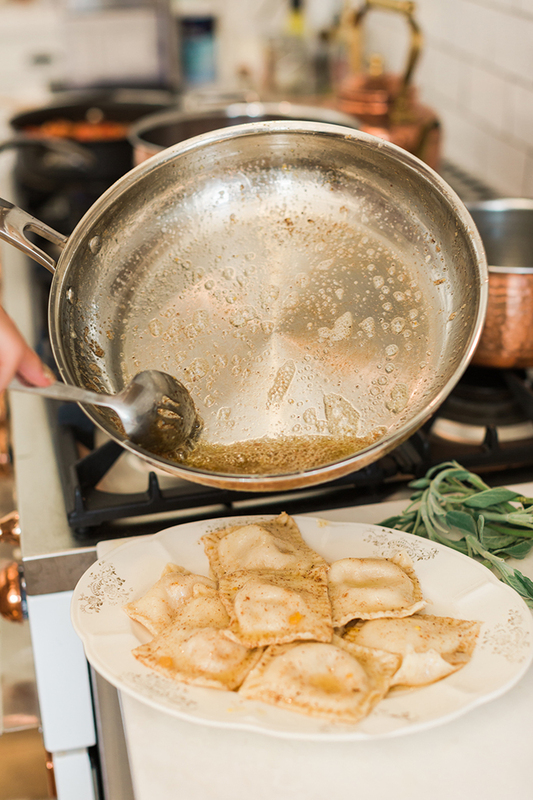 I’ve skipped it in the past, and your ravioli will not form into smooth strips—it will have holes in it. Be sure to let it rest. 4. 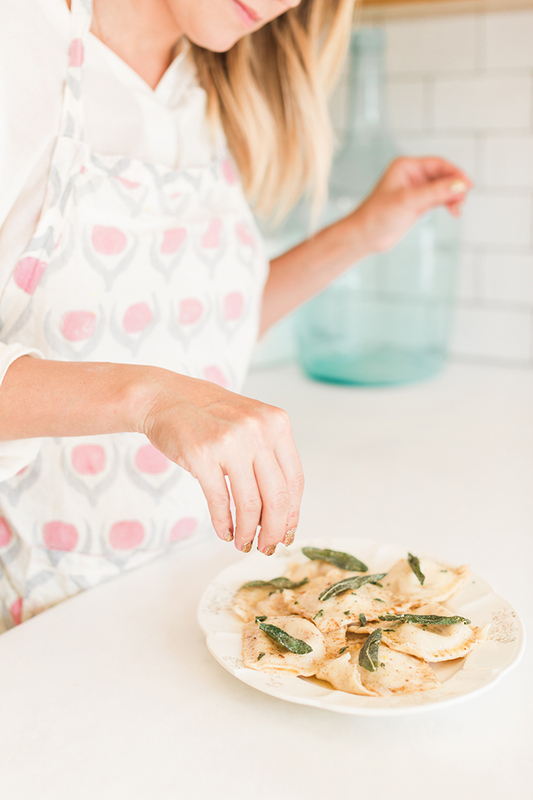 Once your dough has rested, you’re ready to make your pasta. 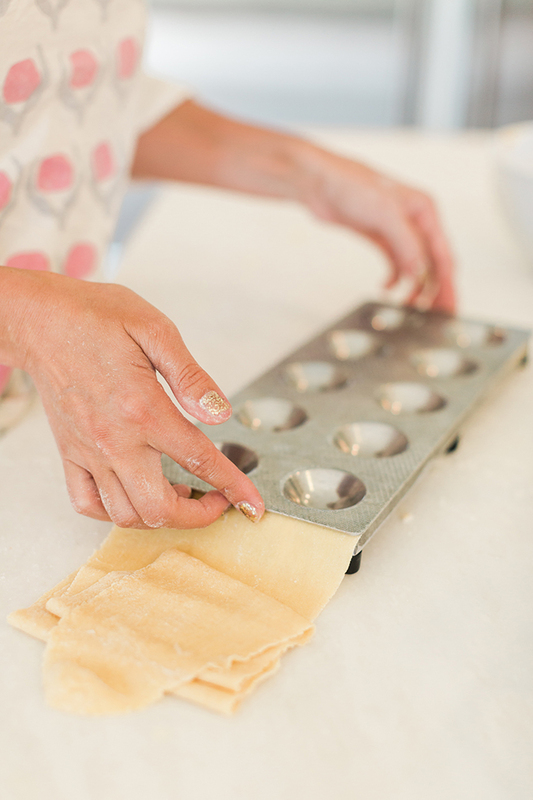 Cut your dough ball in half and set one half aside in the refrigerator while you work with the other half. Dust the counter with flour, then, using a rolling pin, roll the dough out into a flat rectangle. 6. First, make an egg wash by beating one egg with one tablespoon of water. Set aside. Dust your sheet of dough with flour as needed. 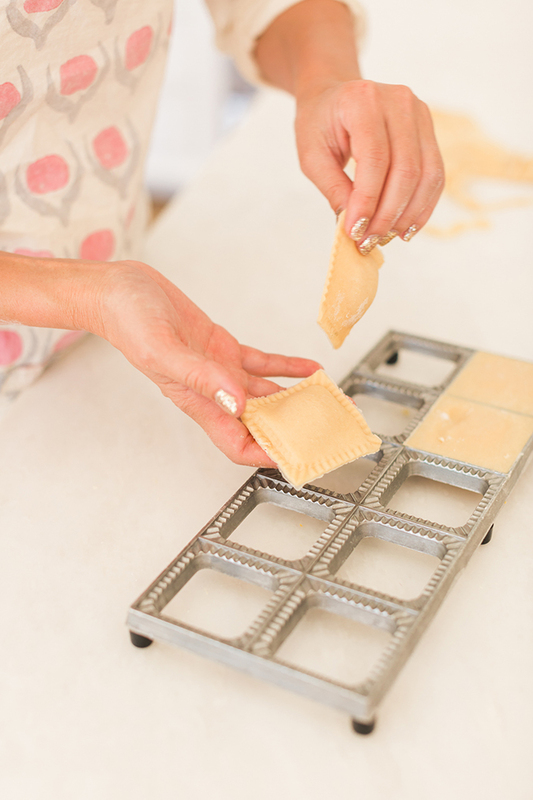 Lie out your dough sheet on your ravioli mold and use your other mold to create little pockets by pressing it down on the ravioli pasta sheet. Brush pasta sheet with egg wash to act like glue. 7. 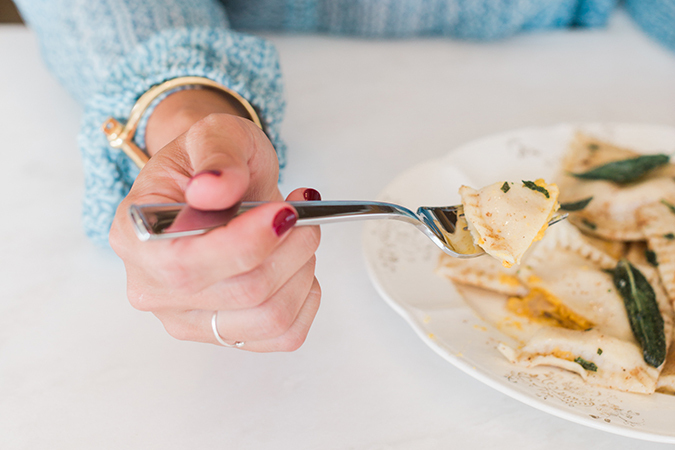 Spoon your butternut squash puree into your freezer-size Ziploc bag and seal it off. Then, cut one corner of the bag to act as a piping bag. You will want to squeeze the squash out of this corner hole, filling each mold area with a dollop of the puree. 8. 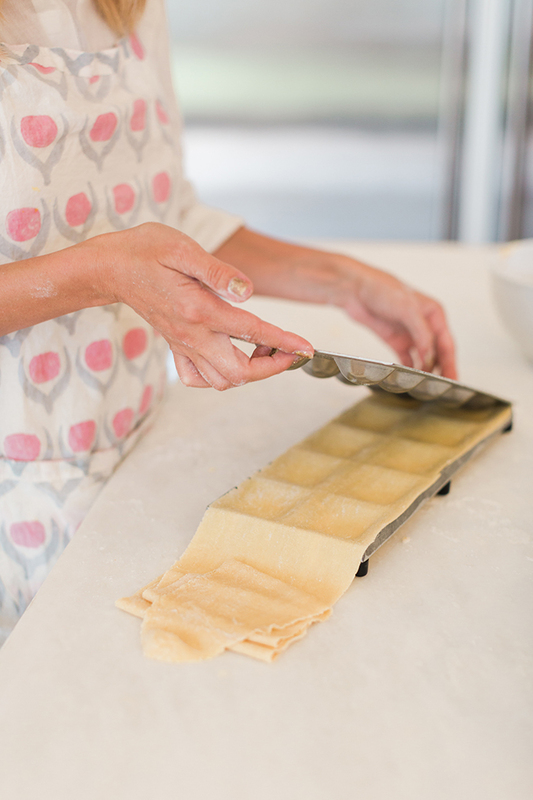 Fold the other half of your pasta sheet over your raviolis. 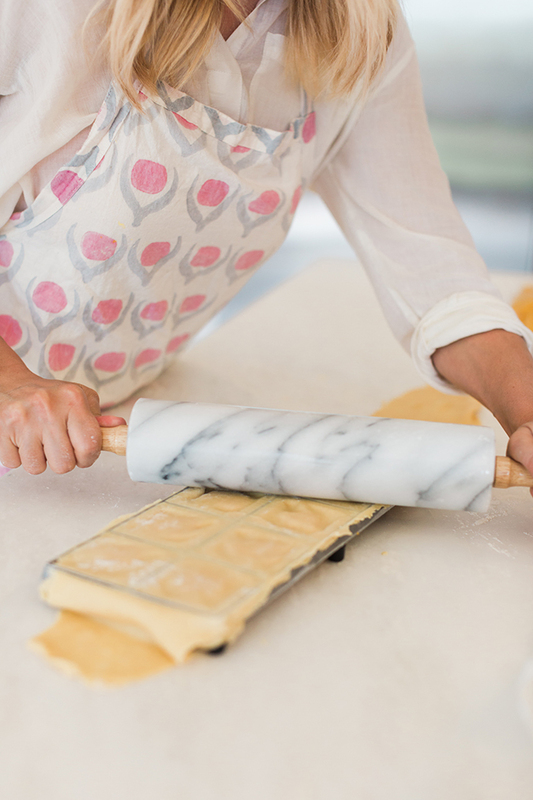 You will then use a rolling pin to roll over the edges to separate each ravioli pillow (depending on what kind of ravioli mold you have, this step might be different). 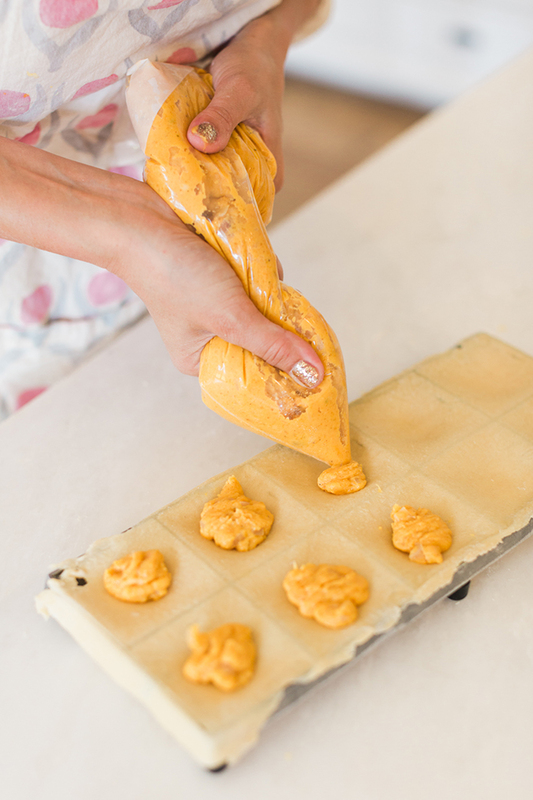 Remove each piece of ravioli from the mold. Now time to cook! 9. 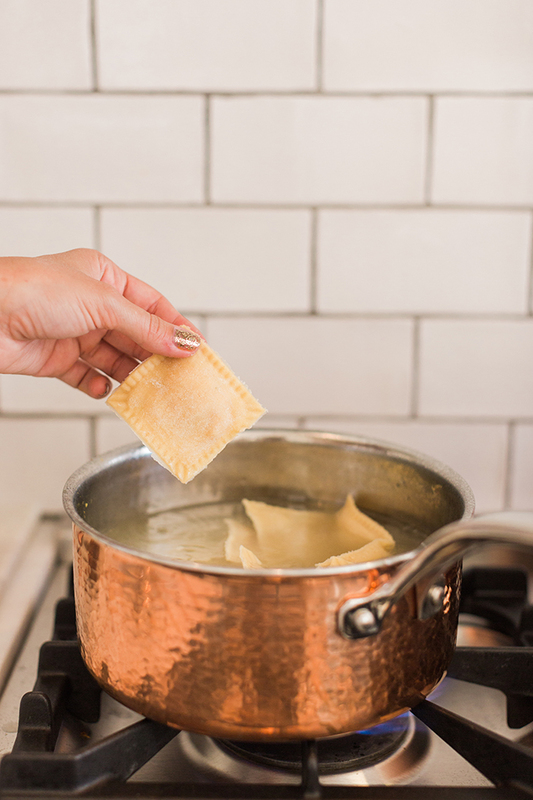 Cook your ravioli in boiling water with a pinch of salt for about 4-5 minutes. They will float to the top when they are ready. 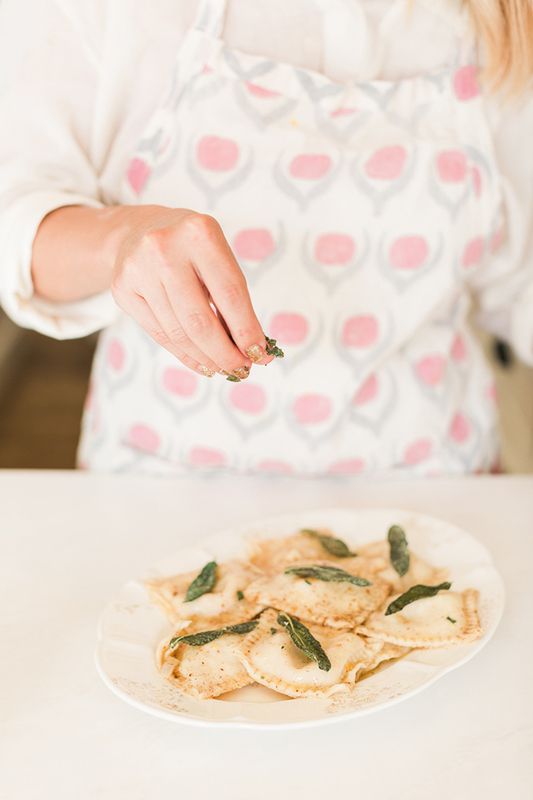 Lift the ravioli from the water with a slotted spoon and set aside. 1. Note: You will want this sauce to be ready before your raviolis are ready, so it’s a good idea to make it while the dough is resting for 30 minutes. Just be sure to have it warm when it’s ready to serve. 2. 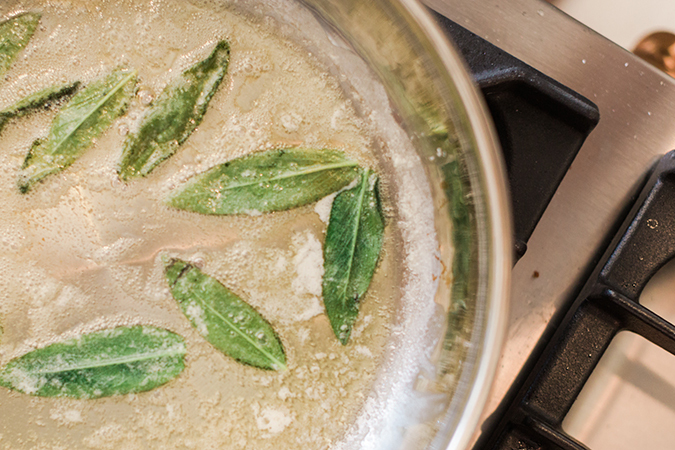 Melt your butter with sage leaves in a large saucepan over medium heat. The butter should sizzle and cook until brown, and the sage should cook until crispy. 3. Add the raviolis to the pan (a few at a time) and sauté for about 30 seconds. Serve warm and enjoy! What fall dishes will you be cooking up this season?